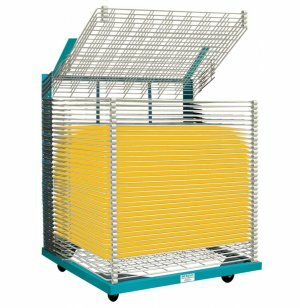 Lightweight Drying Rack - 40 Shelves 30"x46"
For a drying rack that is both lightweight but high capacity, check out this 40-shelf model. It saves on room while still allowing a large number of projects to dry at once. All shelves feature a rust- and solvent-resistant, powder-coated finish. To promote quick evaporation, racks come with non-warping shelves spaced at 1" or 2" intervals. This drying rack provides a useful tool for the busy art room. Just set it up by easily snapping shelves into place and you can have it ready to go within minutes. Remove projects one by one with ease by lifting the shelf above. Ultimate Durability: Racks boast lightweight shelves with a powder-coated finish, which will serve you well for many years without warping. Wire-reinforced shelves are rust and solvent-resistant, to ensure neat and stable stacking of your projects. 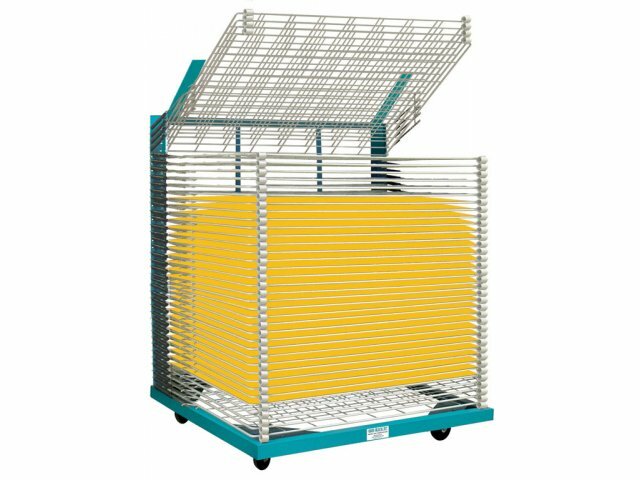 Speedy Drying: Shelves with mesh openings are well-spaced, at 1" or 2" intervals, to promote efficient and quick evaporation drying of art projects.